Work is typically divided along gender lines with men being responsible for paid work and women for unpaid care work. There is a negative correlation between income and level of gender inequalities in unpaid care work. Income can give certain level of independence but reinforces new kinds of dependence and subordination of women in our society in Bangladesh. If women wish to begin their paid work, it means ideologically they want extra jobs and they have to willingly undertake this double burden of household and professional work. The study claims that there is a need of gender responsive rebalancing policies to ensure women friendly working environment to ensure actual empowerment of women in Bangladesh. Over the last two decades, increasing numbers of women have been entering the workforce around the world, particularly in Bangladesh. Gender inequality in labor markets remains a persistent phenomenon where women continue to disproportionately face a range of multiple challenges relating to access to employment, choice of work, working conditions, employment security, wage discrimination, and balancing the competing burdens of work and family responsibilities. Where women’s talents are sometimes wasted because they avoid competitive work environments, it seems important to know which types of work environments are attractive to them. Traditional gender norms, labor market segregation and unbalanced power relations and access to skills and resources have all led to women as the “secondary workforce” – within labor markets, they are treated as flexible and expendable workers and within households as “added workers” (Kabeer, 2008). Although there is no evidence to support the contention that women are less efficient than men, as there are few differences between men and women in cognitive abilities and skills. Bangladesh is experiencing a more than proportionate increase in the female labor force, a process often defined as feminization of the labor force (Standing, 1985). Though international human rights instruments and national laws have provided right to work in a safe and healthy environment but women still face discrimination in the workplace. However, data shows that women’s participation is far from satisfactory and the implementation of the special measures provided by the labor act is questionable. Despite that, women in Bangladesh quite often encounter more obstacles than men in workplaces, and are treated unequally in their terms and conditions of employment. 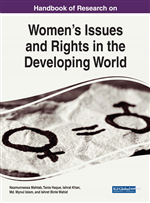 The unequal as well as disempowering environment is explicit both in women’s participation in labor market and also in trade unions (Elson, 1999). Gender-balance or women-friendly environment in working world is still a myth in our country. Therefore time has come to chalk out what are the specific obstacles working women are facing in formal and informal sector jobs and what are the specific measures or policies can be taken to ensure women friendly working environment in Bangladesh; which in long run will encourage women to join and climb higher in workforce. Improvement of women’s situation cannot be achieved without an understanding of the difficulties they face and the needs they have. This is what this study has attempted to unearth. Therefore the purpose of this paper is to fulfill the need for a comprehensive review of the literature surrounding the issues of equity and access in the workplace from a feminist perspective. Government took many policies and measures in promoting women’s employment. A major problem of giving an accurate picture of the labor market because employment data has not been updated since the Labor Force survey 2010which found an increase in women’s labor force participation from 29.2% in 2005 /6 to 36% in 2010. Women have been increasing at a faster rate compared to that of men but still low compared to international standard and women are mostly in low-end jobs. In 2010 the highest number of women 68.84% were engaged in agriculture sector followed by service sector 21.89% and industry sector 13.32%. Government had provisioned separate gender budget to empower women, sanctioned safety net program for poor widows and vulnerable women. From the earlier dim situation, Bangladesh had made a huge jump into the women empowerment. The entire safety net programs are titled towards women. Women are being recruited into the regular cadre administration services since 1982.